Archives : BACK TO BEARISHNESS - 09/12/2011. BACK TO BEARISHNESS – 09/12/2011. Bullishness was short lived as the Bears took control and pushed the market lower. The market fell after touching the 61.8% pull-back level of the recent fall. The belief, that Bear market rallies are sharp and swift, was once again underlined by the swift upmove of the previous week and the sharp fall of the current week. Market left a gap while moving higher in previous week and also while falling down in the current week. Both these gaps, along a cluster of five candles between them, form a Bearish Island Reversal pattern. This pattern has strong Bearish implication and only a close above Sensex 17003 and Nifty 5099 can negate it. The Sensex opened the week at 16812, made a high of 17003, a low of 16142 and closed the week at 16213. The Sensex lost 633 points on a weekly basis. Similarly Nifty opened the week at 5036, made a high of 5099, a low of 4841 and closed the week at 4866. The Nifty too closed with a weekly loss of 184 points. As analysed last week, the weekly formation was bearish despite forming a white body candle, as it was a part of Bearish Continuation pattern called Downside Gap Three Method. It was vindicated by the fall seen this week and the Bearish black candle formed this week, is a part of Bearish Reversal pattern called Bearish Harami. This pattern requires a confirmation in the form of a black body candle in the next week. On the daily charts, Nifty has formed a Juji which is a long legged doji and Sensex has formed a Spinning Top with a small black body. Interestingly both are neutral formations with long upper and lower shadows which indicate the state of uncertainty after a major fall. 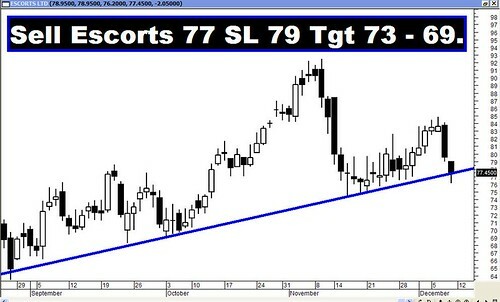 Hence Monday’s candle formation will provide the direction of the price movement in the short term. A white body candle on Monday will form a Bullish Reversal pattern and a black body candle will indicate the continuation of Bearishness. This week both the indices fell with a gap i.e. Sensex 16421-16382 and Nifty 4921-4918. This gap will provide resistance when the market moves higher. Similarly last week saw the indices going up with a gap. If we consider both these gaps with a cluster of five candles between them, then we have a Bearish Island Reversal pattern in place. This pattern suggests that there is more downside to follow and the bearishness will be closed out only on close above the current minor top of Sensex 17003 and Nifty 5099. We were witnessing a pull-back of the current fall from Sensex 17908 to 15478 and Nifty 5399 to 4639. The pull-back levels were Sensex 16406-16693-16980 and Nifty 4929-5019-5109. Interestingly both the indices kissed the 61.8% level and fell from there. Thus the minor top registered last week along with the 61.8% retracement level and the 100dma form a confluence zone. Thus we have a strong Resistance zone between Sensex 16980-17003 and Nifty 5099-5109. Happiness for the bulls was short lived as once again the short and medium term trend turned down. Both Sensex and Nifty closed below their short term average of 20dma (Sensex – 16404 and Nifty – 4920) and medium term average of 50dma (Sensex – 16696 and Nifty – 5016). As a result, the short and medium term trend once again turned bearish. Both the indices continue to be below the long term average of 200dma (Sensex – 17769 and Nifty – 5335). As a result the long term trend continues to remain down. Since last Deepawali, both the indices have been moving lower in a Falling Channel. The bottom end of the Falling Channel, which should act as support, falls at Sensex 14888 and Nifty 4461 and the top end, which will provide resistance, is at Sensex 17743 and Nifty 5371. On a longer term timeframe the Bearish Head & Shoulders and Bearish Descending Triangle on the weekly charts still stand, and so do their targets. The target for the Bearish Head and Shoulders pattern on the weekly charts stands at Sensex 14651-13928 and Nifty 4357-4143. This target holds true as long as the Nifty stays below 5740. Oscillators are painting a mixed picture. MACD continues with its Buy signal despite being in a negative territory. ROC too continues with its Buy signal as it remains in positive territory. RSI has given a fresh Sell signal as it went below the centerline on Friday. Stochastic Oscillator too has given a fresh Sell signal as %K went below %D. Directional Indicators too gave a Sell signal when +DI went below –DI. ADX has decreased and went below 20 suggesting sideways movement. Interestingly MFI has moved higher at 56 and signaled a Buy. OBV continues with its Sell mode. Nifty OI PCR has fallen and is at 1.13. Highest Open Interest continues at 4700 Put. Highest Call writing is seen at 5100 strike. Friday has seen very high Open Interest addition to the 5000 Call. Hence one can expect a Nifty movement from 4700 on the lower side to 5100 on the higher side. In the near term, the level of 5000 will also provide strong resistance. Trendline Resistance for the Sensex is at 16899. Trendline Support for the Sensex is at 15381. 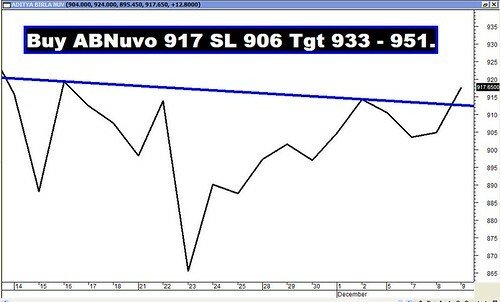 Trendline Resistance for the Nifty is at 5067. Trendline Support for the Nifty falls at 4609. For the week ahead, Sensex will find Support at 15849-15478-15097 and will find Resistance at 16488-16756-17043. For the week ahead, Nifty will find Support at 4754-4639-4521 and will find Resistance at 4946-5034-5113.